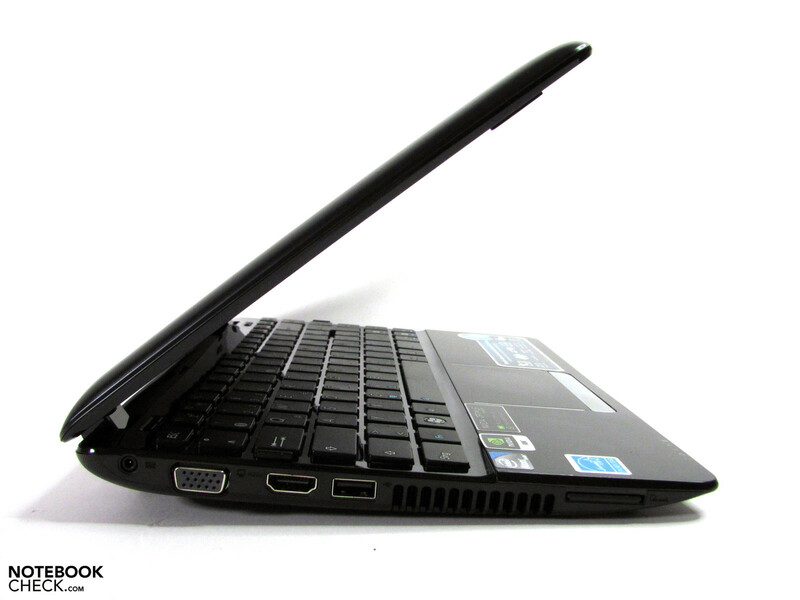 Power-Netbook. 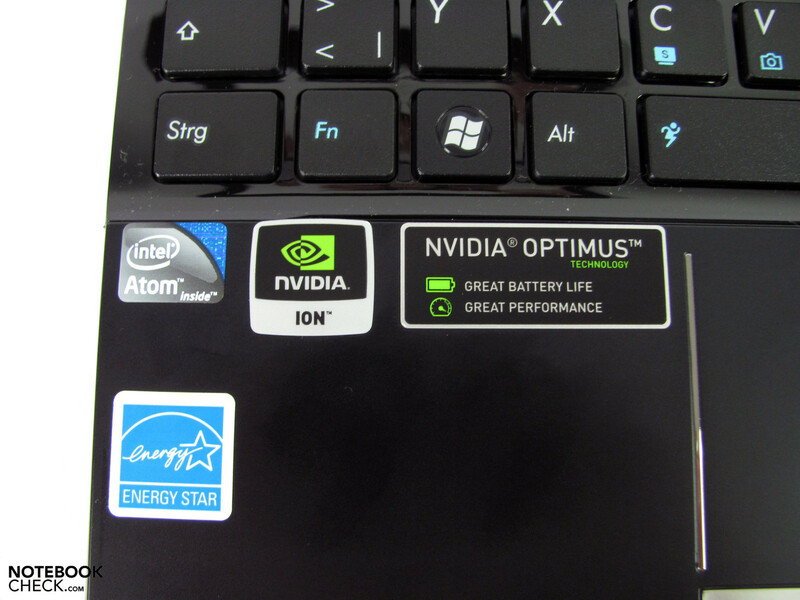 Even the first generation of Ion Netbooks proved that they could shine in many application areas with appealing graphics performance. 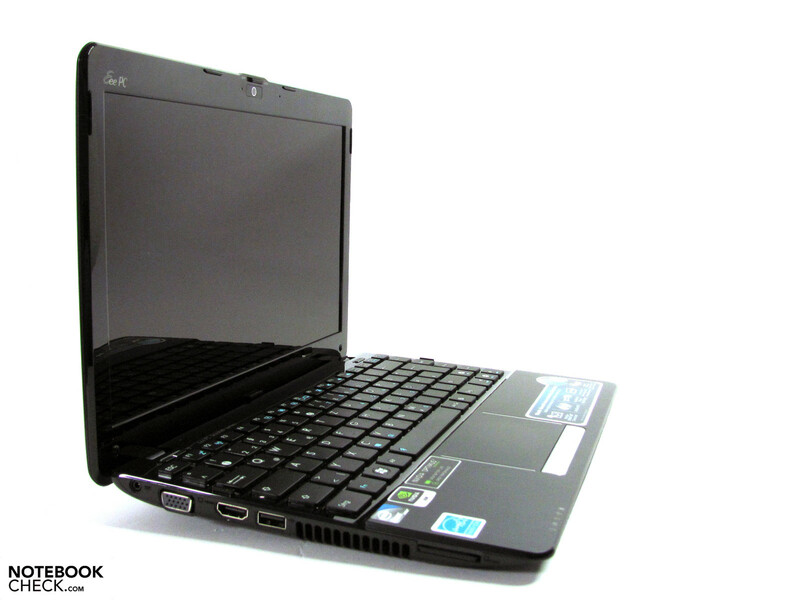 Ion 2 builds on this achievement, and even provides a dual-core Atom processor to assist the Eee PC 1215N. What can be expected has been tested by us. 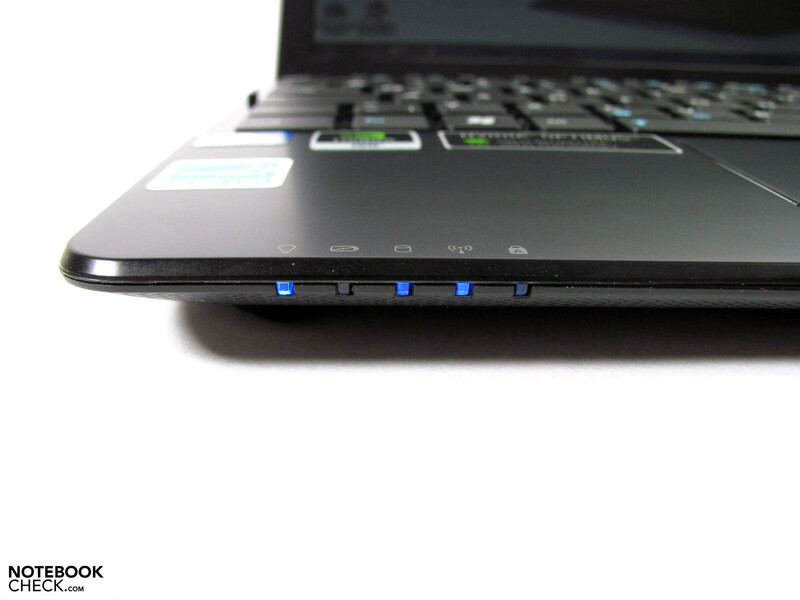 One big shortcoming of Intel based Netbooks up until now is still the for some purposes insufficient graphics power. Little has changed in this respect with the current Intel GMA 3150, compared to the Intel GMA 950 graphics processor. Especially when it comes to playing back HD content smoothly, the DXVA capability is still missing from the GPU. Nvidia's Ion chipset from the first generation could in comparison bring significantly more performance from the beginning, and did not disappoint with its full-HD performance. 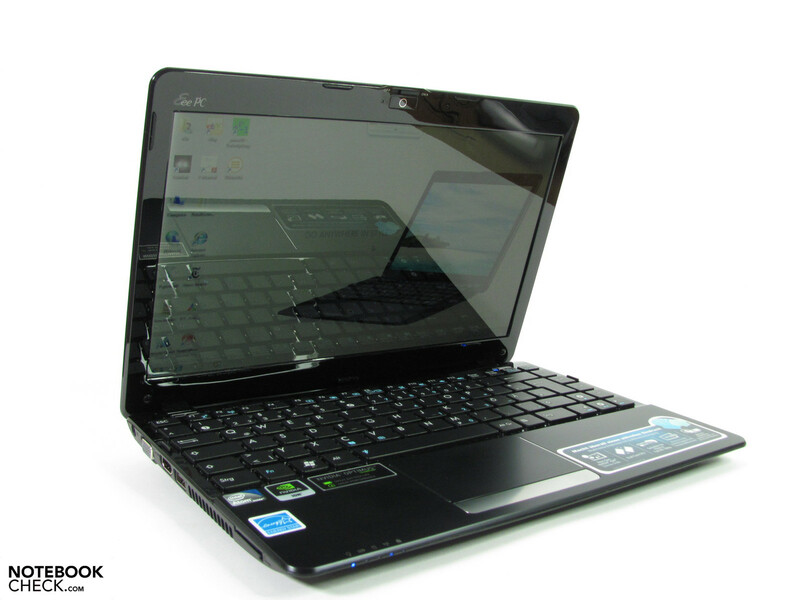 Ion 2 is now the next development from this train of thought, to also provide Netbooks with good graphics performance. Due to licensing reasons Nvidia Ion 2 did however have to be limited to the graphics section, and could therefore not develop an entire chipset. 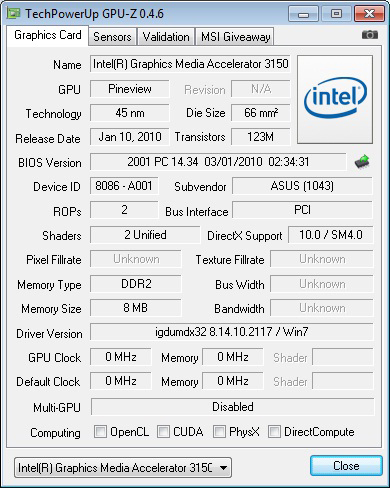 This is now provided by Intel, including GMA 3150, and was extended with a graphics chip and Optimus technology by Nvidia. 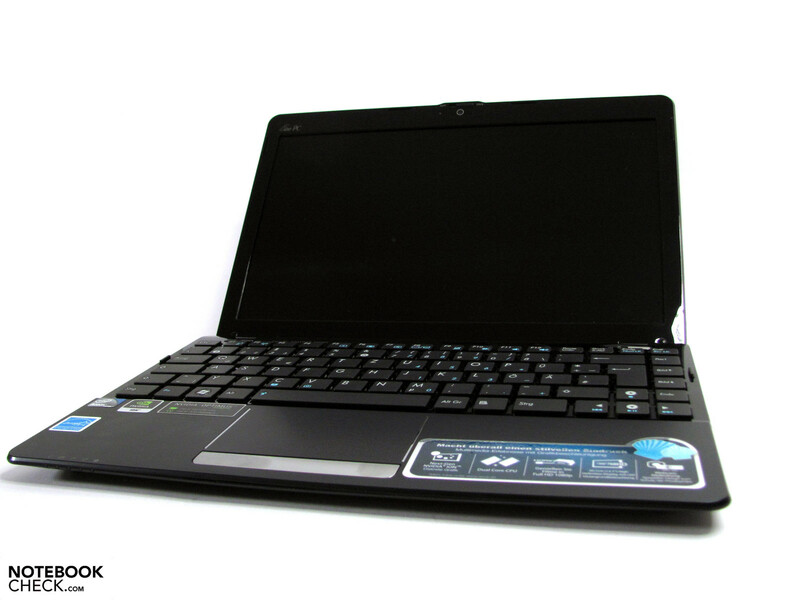 The Asus Eee PC 1215N is currently available in black and silver, with identical configurations. 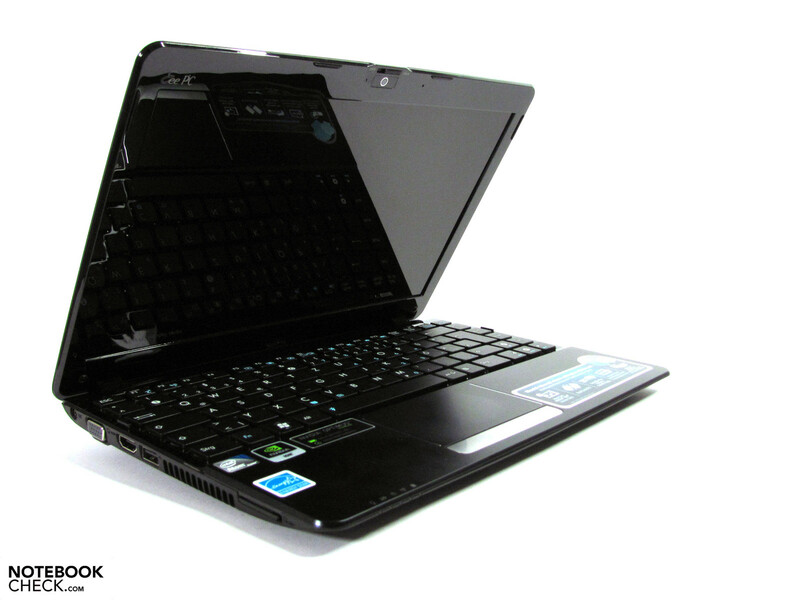 We tested the black model, which contained the Intel dual-core Atom D525 with 2x 1.8 GHz, 2 GB of DDR3 RAM, 250 GB hard drive, a 12" WXGA display, and the Ion 2 chipset. 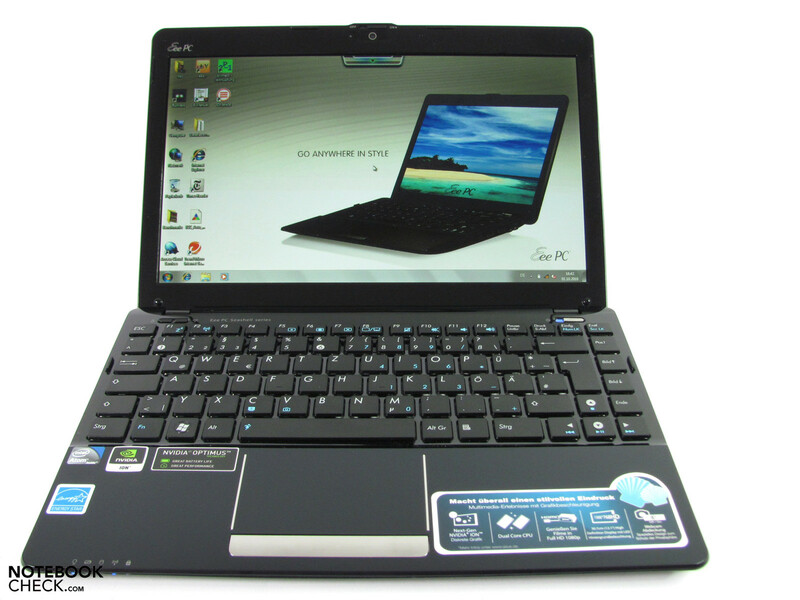 The retail price is currently roughly 500 Euros, which puts it among the elite in the Netbook space. 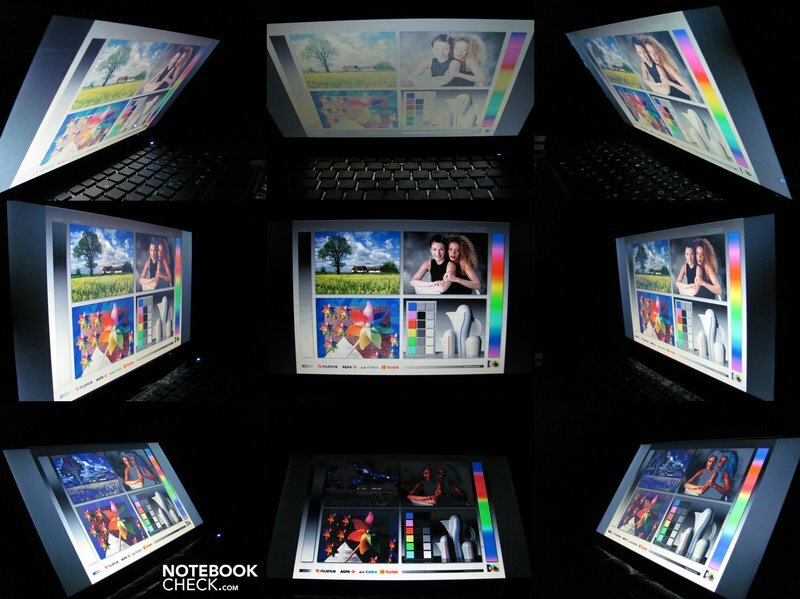 After the recent high-gloss hysteria in the notebook domain, some manufacturers appear to be orientating themselves more in the direction of practicality and sensibility with some models, and are releasing new devices with more matte surfaces. 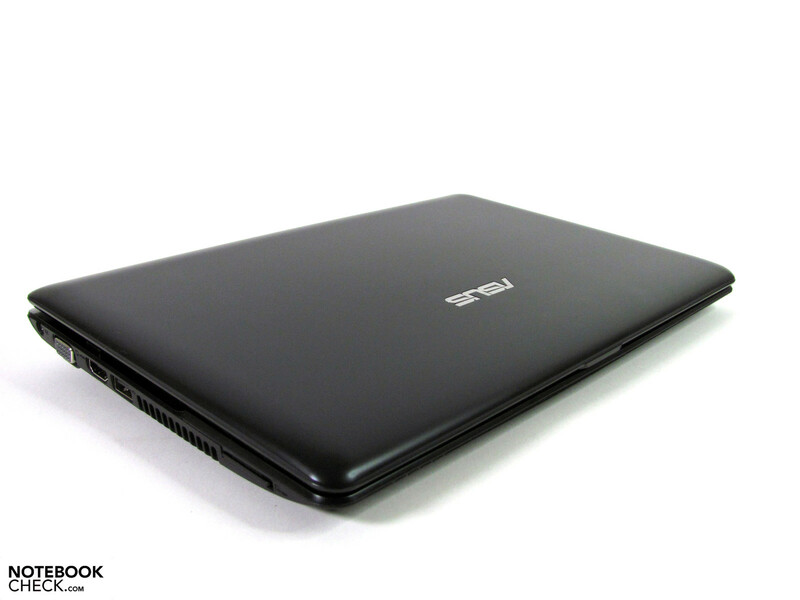 This also applies to the Asus Eee PC 1215N, which is almost exclusively clad in silk-matte black. Finger prints and other blemishes are less visible as a result, and it takes longer for these to accumulate. Merely the display frame is covered in a high-gloss surface, which is incidentally less favorable than some other areas could have been, since this causes not only the display to provide reflections, but also its frame. As previously mentioned, there is also a silver variant available, as well as one in red which is already listed on the Asus website, but is currently not yet available to buy. The surfaces altogether make a good quality and haptically pleasing impression, but do not reach the standard of some of the competitor models such as the HP Mini 5101. 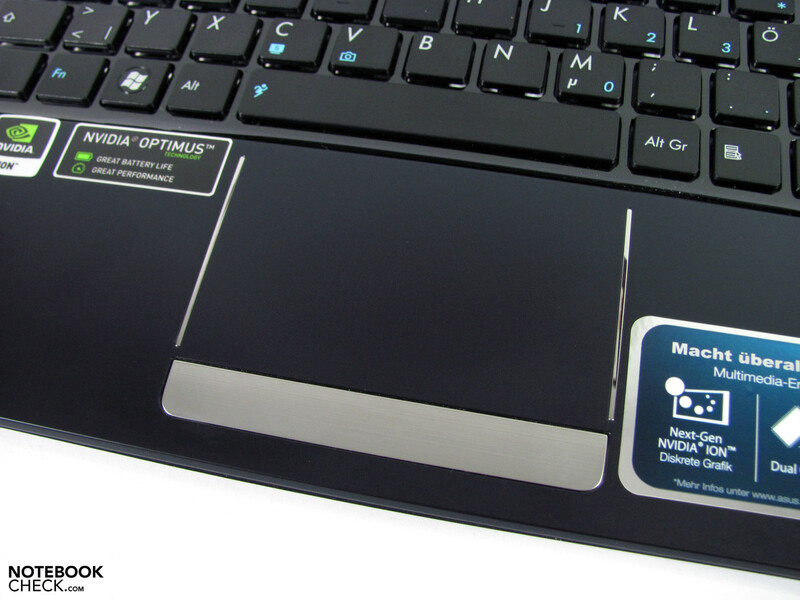 Smart buttons and decent silver colored panels, such as around the touchpad, improve the general appearance. 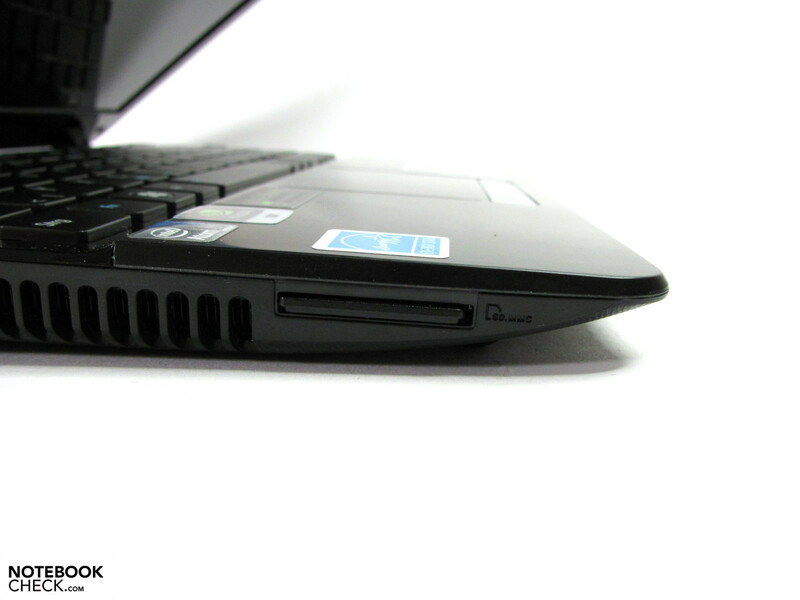 The stiffness of the case is good, and the surfaces only bend in some areas with mediocre pressure applied. These include the keyboard and the display lid. The display is firmely held in place by solid hinges, but cannot be opened with a single hand due to the weight distribution on the base plate (battery at the back). 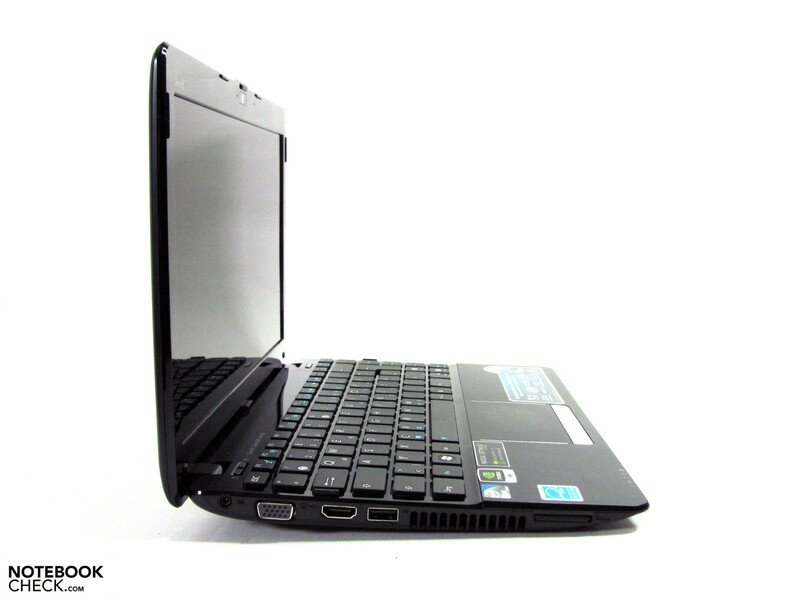 The dimensions of 296(W) x 203(D) x 37(H) mm, as well as the weight of 1.45 kg, are more or less the same as other 12" Netbooks in the lower price range, and thus don't provide any particular advantages. The tested model is equipped with a 6-cell battery; alternative variants with different weights, sizes, or battery lives are currently not listed. 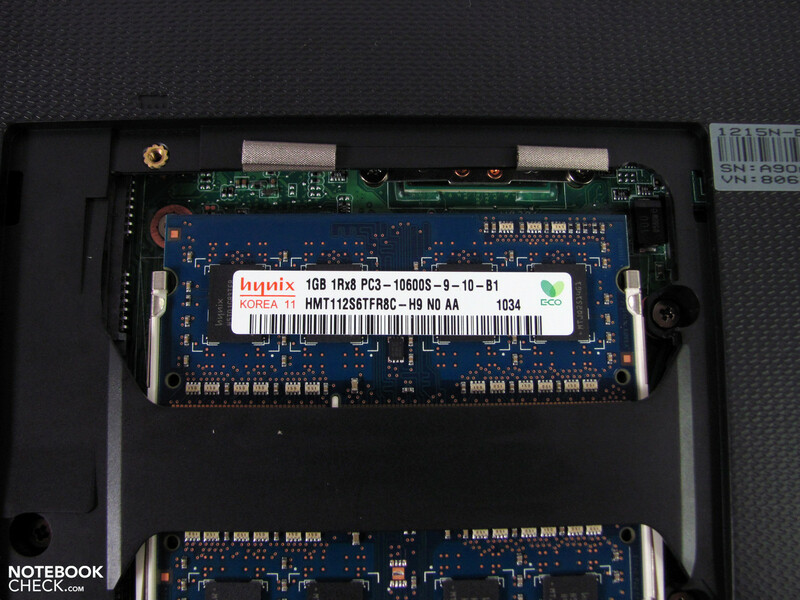 The bottom surface provides access to the two RAM slots via a maintenance panel, other access panels are not available. 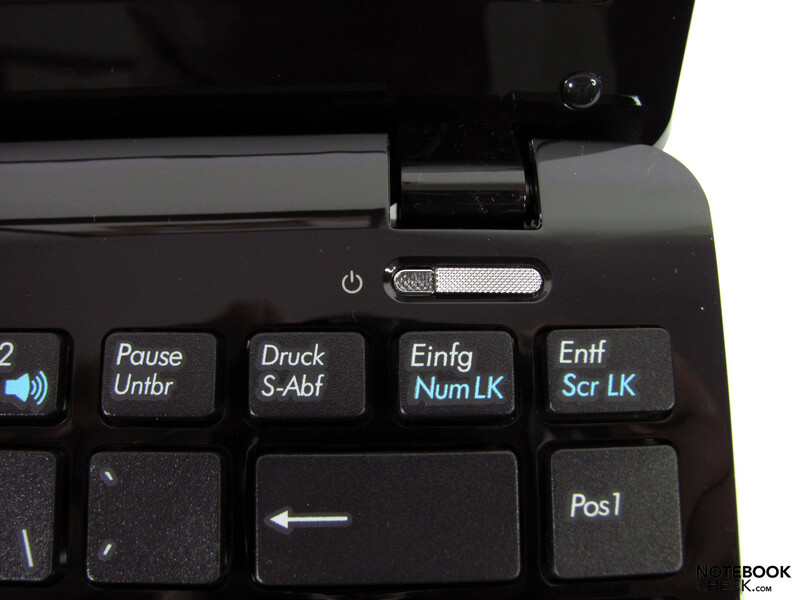 Asus touts USB 3.0 on the Eee PC 1215N website extensively. Unfortunately this interface is only available optionally, and not included with our tested model. We therefore had to make due with 3x USB 2.0, VGA, HDMI, LAN RJ-45, Bluetooth 3.0, WiFi 802.11 b/g/n, audio input/output, CardReader, and a 0.3 MP Webcam. Somewhat surprising is the good signal quality from the analog VGA output, despite the available HDMI interface, which provides a good resolution with 1280x1024 picture pixels. We are very happy with the distribution of the interfaces. 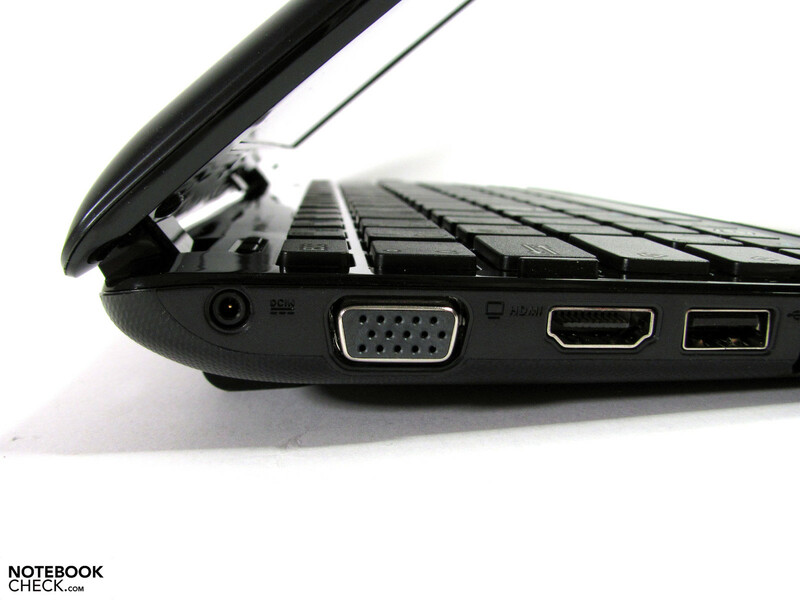 All the ports have been moved towards the back as much as possible, and thus prevent possible issues with attached peripheral devices getting in the way. While the lack of a USB 3.0 port is relatively unimportant when it comes to printers or a mouse, external hard drives would clearly profit from its addition. These have achieved data transfer rates of up to 120 MB/s depending on the notebook in our previous tests. Even lower performance hard drives managed to reach rates of 70 MB/s, and are thus twice as fast as the best USB 2.0 hard drives, which average with rates of about 33 MB/s. 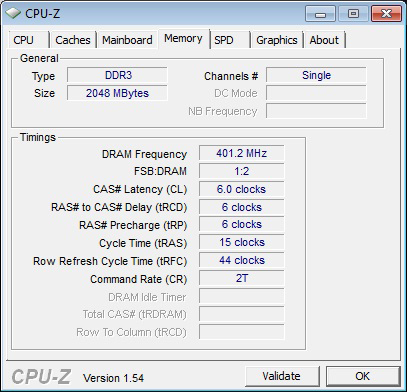 We achieved a maximum of 27.9 MB/s using the USB 2.0 interface on our tested device. 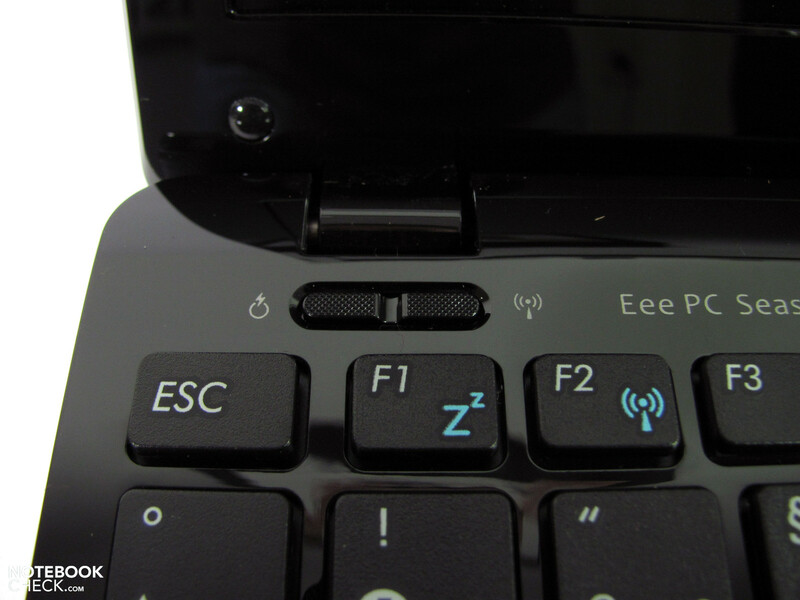 Provisions for further additional extensions, such as a Docking Port or an ExpressCard slot, are not available for the Eee PC 1215N; although this would not be common for a device of this type. The warranty covers a period of 24 months. 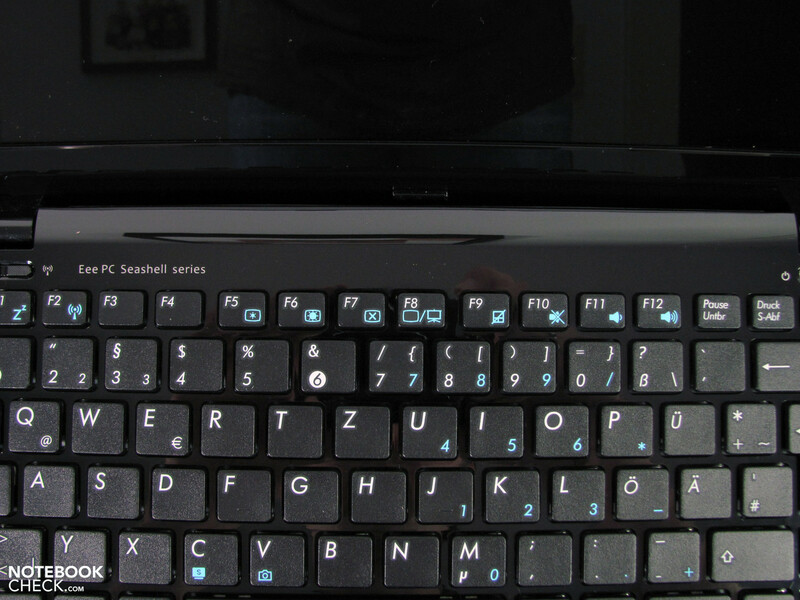 The keyboard with its chiclet style design uses more or less the whole width of the case, and can shine with amply sized keys. 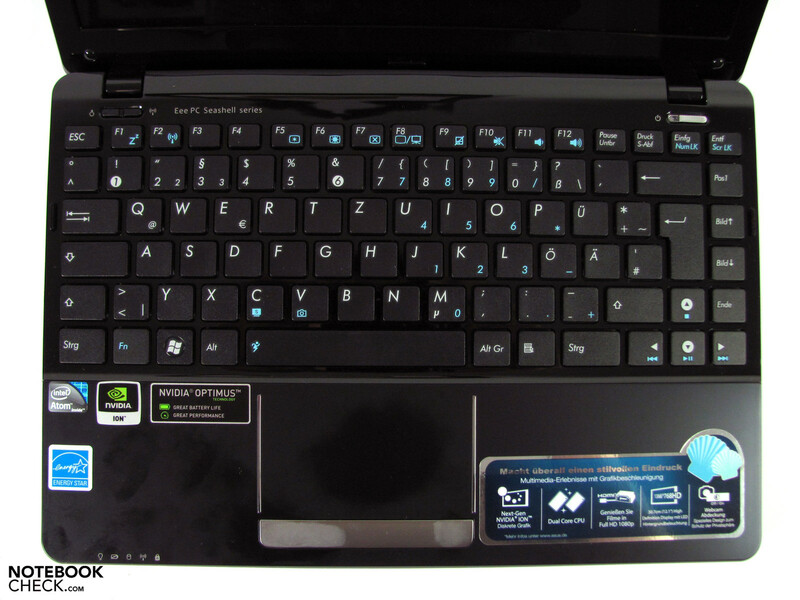 Particularly the arrow keys are very big, and even surpass those on many 15" and 17" notebooks. The layout adheres to the usual design, and allows a swift familiarization. Many additional functions are integrated via the Fn combinations, wireless modules and the power saver / high performance profiles can also be accessed via hardware switches. The labeling is clear with good contrast, and can be read easily in normal lighting conditions. 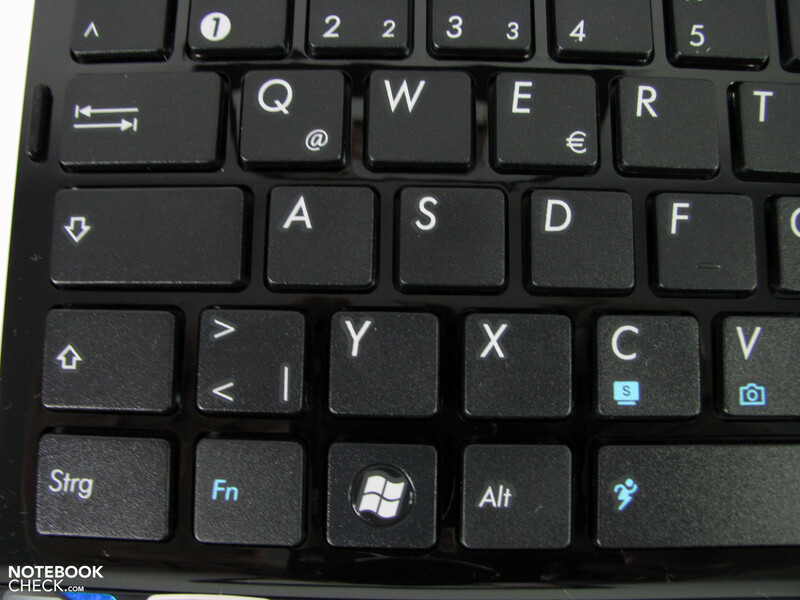 A backlit keyboard is not available. The keyboard is firmly integrated into the case right up to the edges, although the central area can be bent when applying pressure. This did not have a negative impact during the typing test, but frequent typists could likely develop a dislike for this over time. Otherwise the keys have a medium length travel, a somewhat mechanical sounding endstop, and a decent pressure point. Most users should immediately take a liking to it. 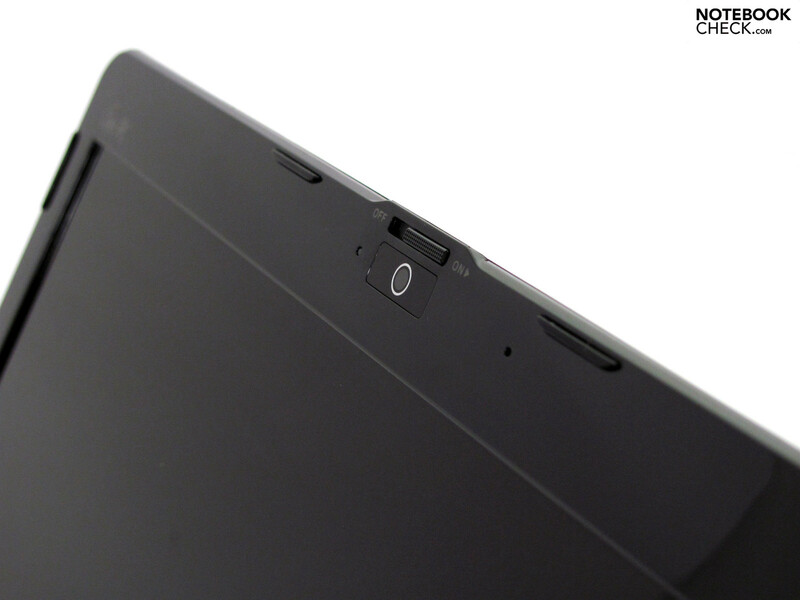 The touchpad is very big, and as a consequence allows ideal use of the multi-touch functionality. Together with the successful traction properties of the surface, the multi-finger gestures can be well used. 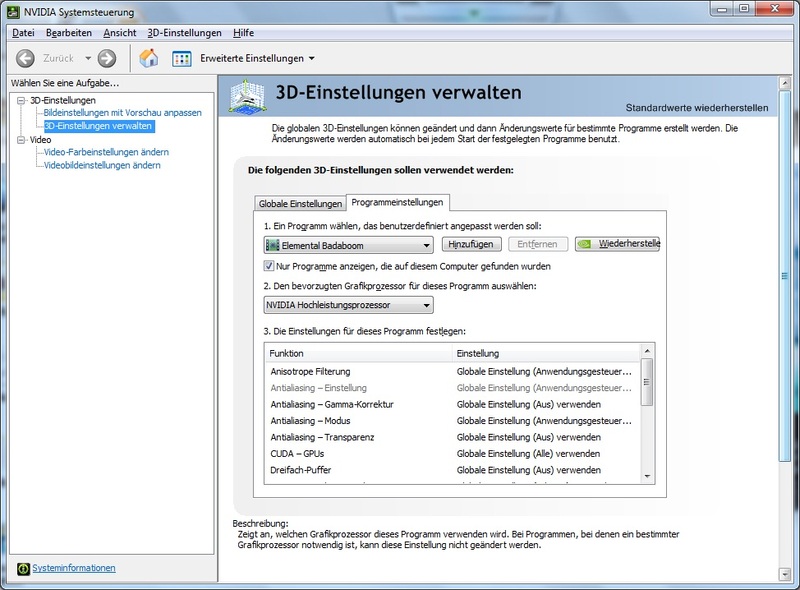 The Synaptics system configuration allows the functions to be adapted individually. 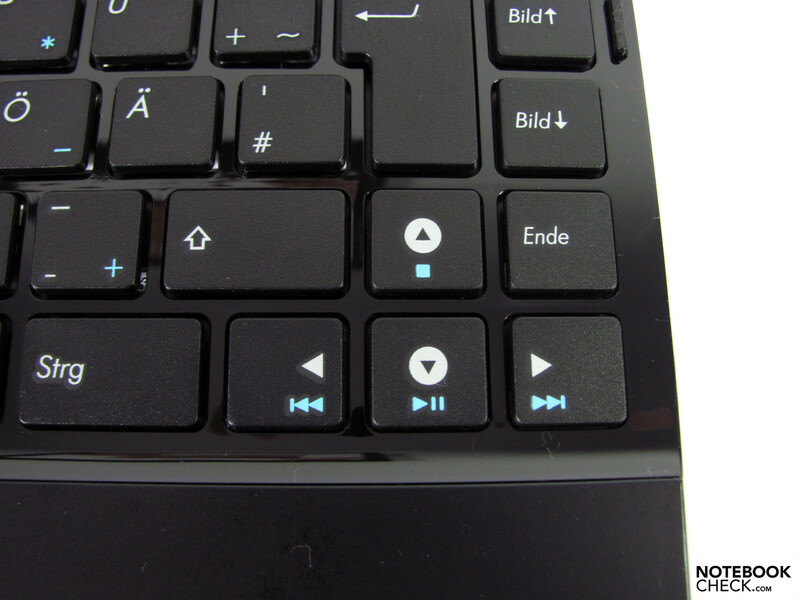 The stubborn touchpad buttons, which require a resounding 'click' and are only reliable towards their edges due to the one-button design, are less favorable. A Netbook in this class would be expected to be well adapted to the requirements of a mobile device. 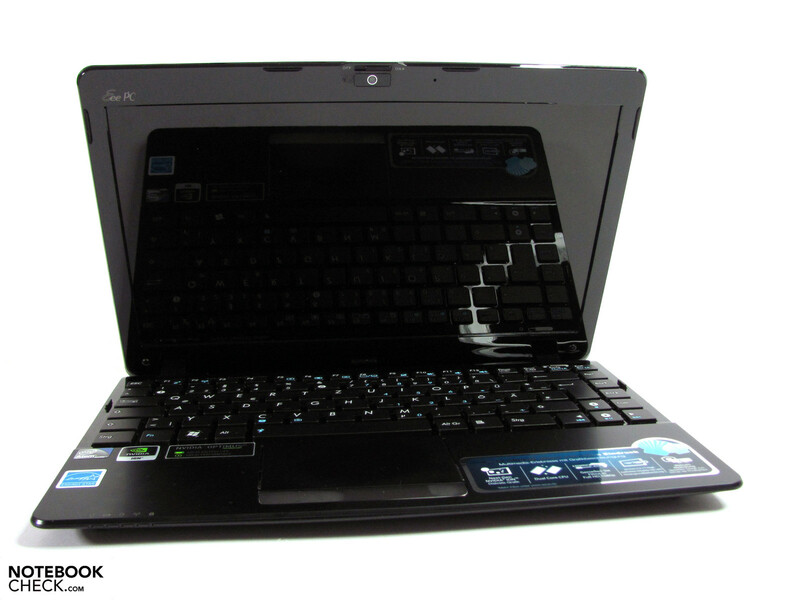 Unfortunately this is not really the case with the Eee PC 1215N, at least not when it comes to the display. Adopted was a 12" LED WXGA display with a resolution of 1366x768 pixels, which provides for a pleasant working area relative to the display dimensions. The reflective surface of the display, and the below average maximum brightness of 174 cd/m² can however only be categorized as inappropriate. Combined both of these characteristics make using the device under direct sunlight near enough impossible, and the use under varying lighting conditions, such as in a train, is only possible within limits. Occurring reflections cannot be trumped by the too weak brightness of the display, which implies that the reflections of surrounding objects is more pronounced than the displayed images. Indoors this scenario is less likely, but even in these surroundings consideration has to be given to the lighting conditions, clothing, and seating position, since these factors can have a negative impact on the visibility of the display. Due to the fact that this scenario is exacerbated by reduced brightness, it is likely that the maximum brightness will be used at all times, which eliminates the possibility of using more frugal power settings with a brightness of around 130 cd/m². Altogether from 9 measurement points we determined a very good illumination distribution of 90%, and an average maximum brightness of 166,8 cd/m². 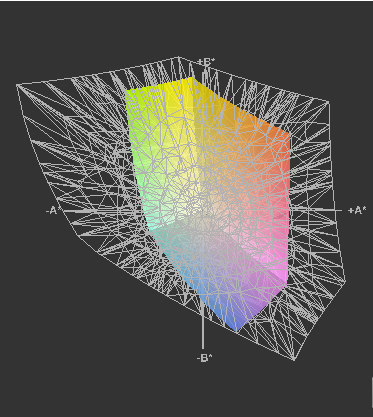 The color space is representative of current standard displays, and covers noticeably less than the sRGB color space. The same can be said of the contrast level of 204:1, which provides a meager black, that is not sufficient for representing multimedia content. The viewing angle stability is noticeably better horizontally than vertically as usual. The displayed images remain recognizable at all times, and merely lose brightness and saturation. The viewing angles from above or below from wide angles cause inverted or faded images, which can become unrecognizable from extreme angles. The performance determining component of our tested device is the Nvidia Ion 2 graphics chip, and the Intel dual-core Atom D525, which are integrated with the Intel NM10 chipset. In addition to this are the 2 GB of DDR3 RAM, and a 250 GB hard drive. 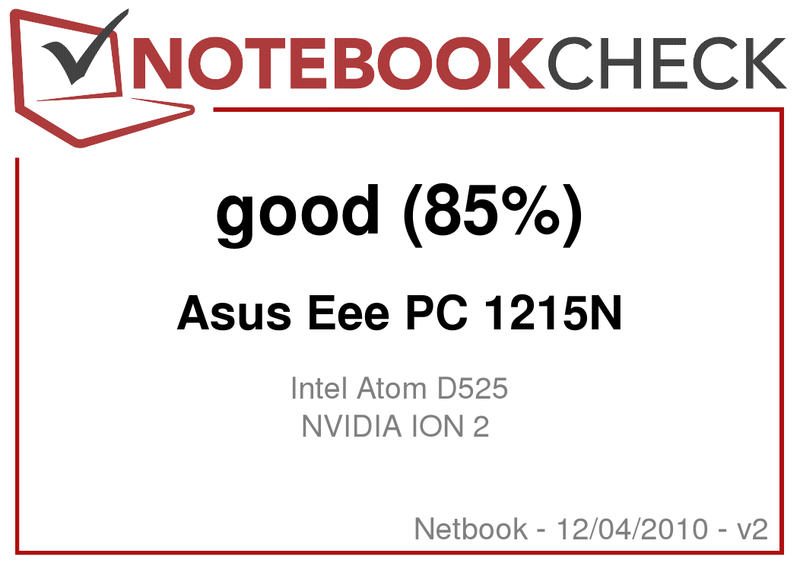 The adopted Intel Atom D525 CPU is actually intended for Nettops, and makes itself particularly noticeable due to its high TDP of 18 Watts, compared to the mobile variant Atom N550 1.5 GHz (8.5 Watts). With respect to performance this disadvantage is at least compensated for by the higher clock speed of 1.8 GHz, which should provide for better performance together with the second core. Our CPU benchmarks can however only confirm these expectations partially. The single core superPi 32m calculation required 3825 seconds with the Atom D525 processor, wPrime 1024m used all the threads and required 1692 seconds, and the Cinebench R10 32-bit achieved 634 (single) and 1773 (multi) points. This shows that programs which are conceived for several cores profit significantly more than single-thread applications, that merely benefit from the higher clock speed. Please refer to our comprehensive CPU benchmark list for comparisons. Most practical work tasks are smoothly carried out. Particularly when running applications in parallel, with several open browser tabs, and playing music in the background, it does not lead to a apparent limitations. Conversions or demanding image editing tasks, such as the use of filters or processing of video, do bring the device to its limits fairly quickly though. 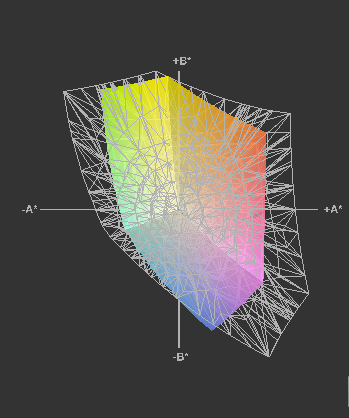 This can however be noticeably streched, assuming the CUDA engine can lend support with the appropriate software. In this case the demanding conversion is carried out in the background by the graphics chip, and the remaining applications have enough system resources available. 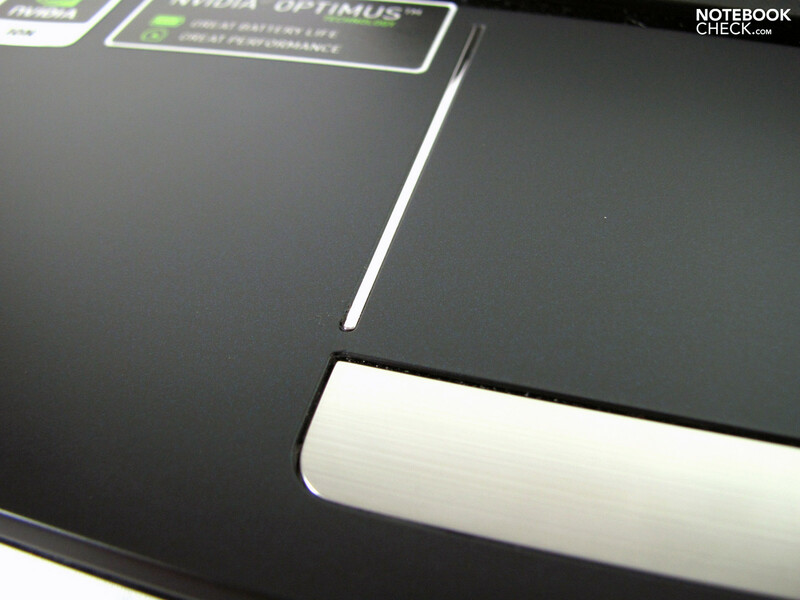 Our test system had 2 graphics chips, which were automatically utilized depending on the application and requirements by Nvidia's Optimus technology. For office and internet etc., the Intel GMA 3150 is sufficient, and for full-HD video or simple 3D games Ion 2 is automatically activated. At least that's the idea. 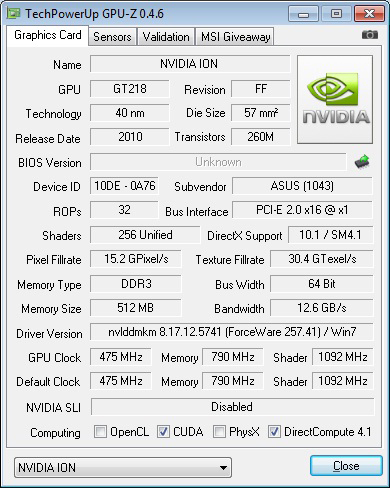 A glance at the Nvidia system configuration is to be recommended regularly, since the test showed that the preferred GPU is not always assigned to installed programs. In practice the system works remarkably well following the correct assignment. The user does not notice the switch, and has an enormous comfort advantage compared to alternative solutions, such as those that require manual switching, as a result. 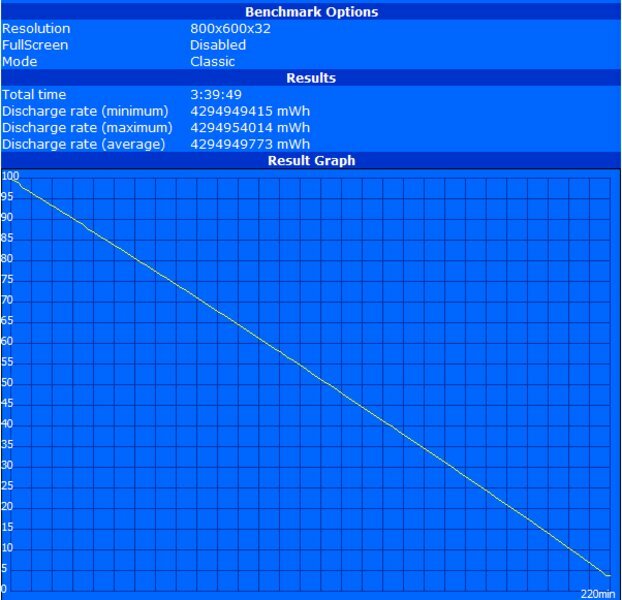 During the 3D Mark Vantage test the device reached 725 points (3D Mark'06 2409 points), Cinebench R10 OpenGL Shading (32-bit) offered 1266, and Cinebench R11.5 6.26 points. 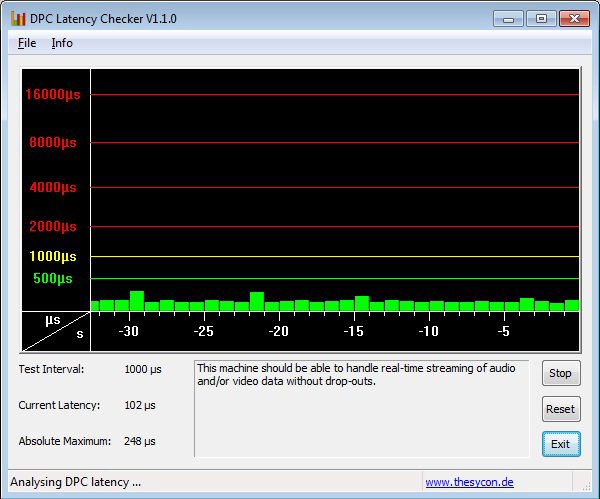 Our full-HD test videos could be played back without any glitches, and with low CPU utilization, as we expected. YouTube videos also played smoothly. 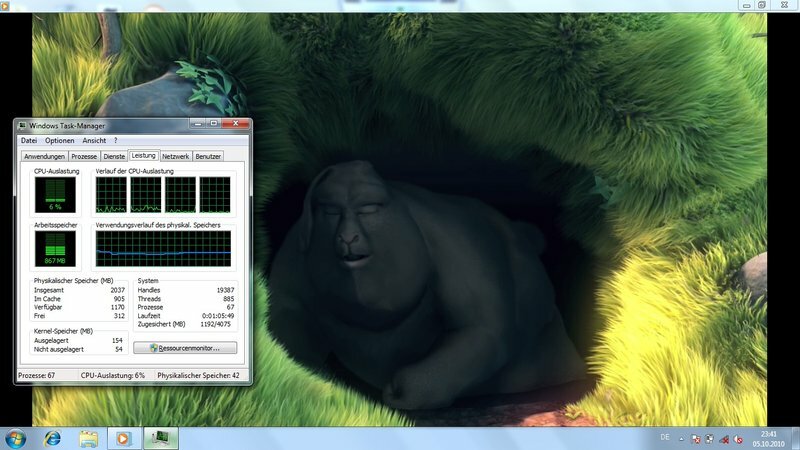 Using Badaboom we converted a video with the CUDA engine, and achieved 22.7 FPS. This is a little less than the Nvidia Ion 1 in the Samsung N510 achieved with 23.9 FPS, but we also used a slightly different video file with a slightly different resolution. A direct comparison is hence only possible to a certain extent. 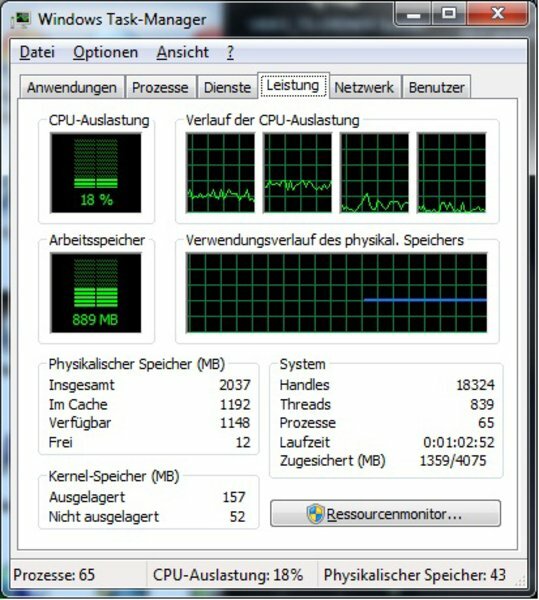 The CPU utilization did however lie at less than 10%. 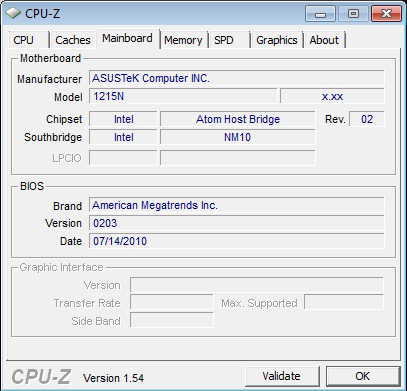 The latencies of the Asus Eee PC stayed within permissible boundaries throughout, and didn't indicate any limitations. The application performance is subjectively good, and is also confirmed with the benchmark result of 1794 points from PC Mark Vantage. Office, internet, video-telephony, multimedia and also, with the above mentioned limitations, image editing can be accomplished with good performance. 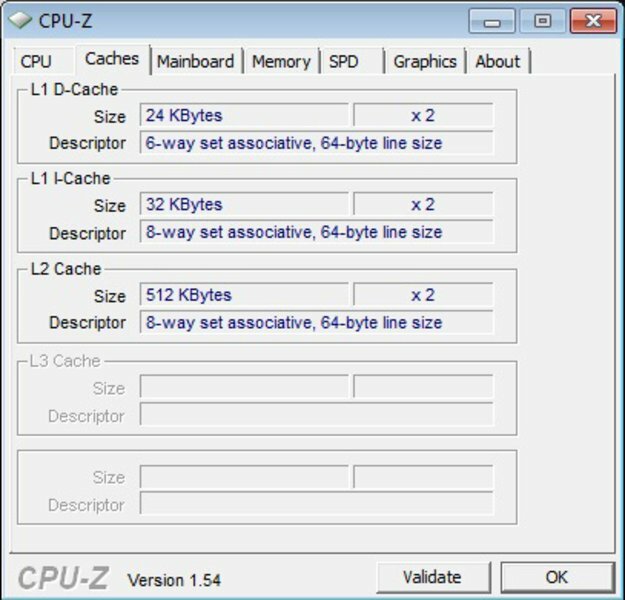 But programs that are not optimized for multi-core processors are especially hindered, although the remaining components could still be exerted to a higher extent. The mass storage device is as can be expected, a conventional hard drive from Seagate, that turns with 5400 RPMs. The data transfer rates at 60.9 MB/s on average, are in the usual domain, and don't indicate any disadvantages. Faster storage devices such as hard drives with 7200 RPMs, or even SSDs, as indicated by previous tests, can only make limited use of their speed advantage, since the Atom CPU is not always fast enough to process the data. As the benchmark results already lead to assume, demanding 3D shooters with a high resolution and quality settings aren't worth serious consideration. Less demanding games can however be played smoothly with the native WXGA resolution, and are displayed considerably well. 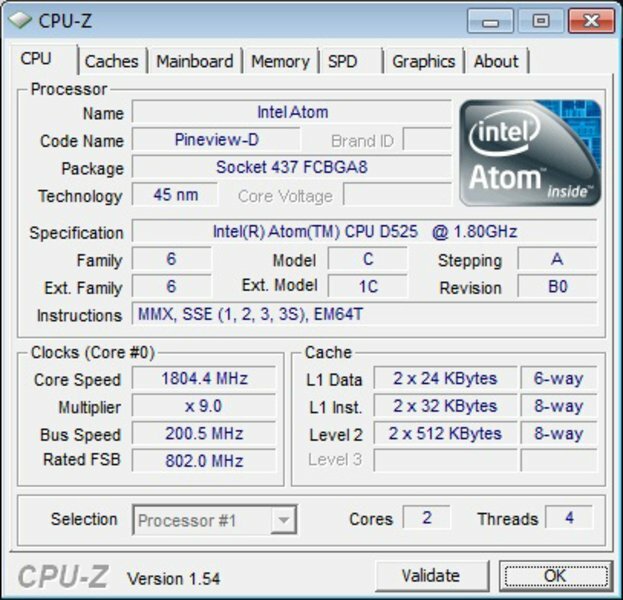 The bottleneck in the system appears to be the Atom CPU, rather than the Ion 2 graphics chip, since the results are partially lagging behind Intel HD combinations with higher performance CPUs. We tested Sims 3 and Anno 1404. Sims 3 works well with medium and low settings. Despite the high frame rates there are still short intermittent glitches from time to time. It is also possible to play with the native display resolution, but this requires lowering of the quality settings. With our minimal settings it was also possible to play Anno 1404, after a noticeably long loading time, with a subjectively smooth 31 FPS. Limitations were not apparent. Even when using the native resolution of 1366x768 pixels, and low quality settings, it is only necessary to compromise 7 FPS (24 FPS), which is still enough to provide for a glitch free game play. The system noise is not especially quiet, but very very restrained in all scenarios at 30 dB(A), and merely noticeably with 33 dB(A) under a full load. 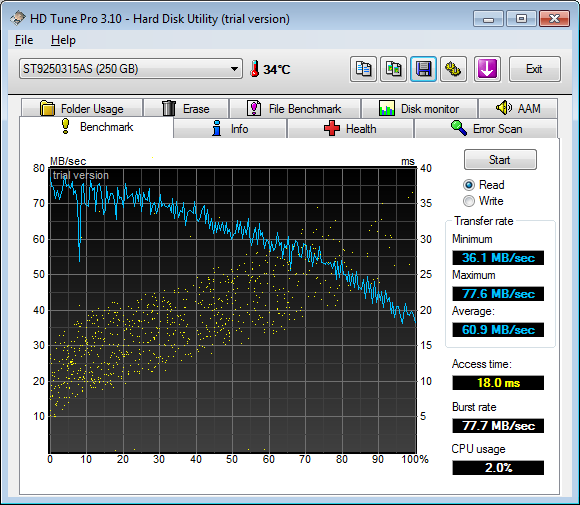 Even the hard drive is in line with this almost non-existent noise ambiance, with 30.9 dB(A), and only makes itself noticeable when accessing data with a quiet rattling. The low cooling fan activity doesn't lead to a pronounced development of heat despite the desktop CPU. The surfaces consistently stay very cool, and as a result allow all thinkable types of use including extended resting on the lap. (+) The maximum temperature on the upper side is 28.8 °C / 84 F, compared to the average of 33 °C / 91 F, ranging from 21.6 to 53.2 °C for the class Netbook. (+) In idle usage, the average temperature for the upper side is 28.7 °C / 84 F, compared to the device average of 29.8 °C / 86 F.
(±) The average temperature of the palmrest area of similar devices was 29.3 °C / 84.7 F (-0.7 °C / -1.3 F). The integrated speakers are sufficient for occasional background music while working, short videos, and less demanding games. High frequency centric, with little mid-range and hardly any bass, describes the acoustic characteristics, and will lead more demanding users to quickly reach for external speakers and headphones, which immediately provide a significantly improved listening experience. 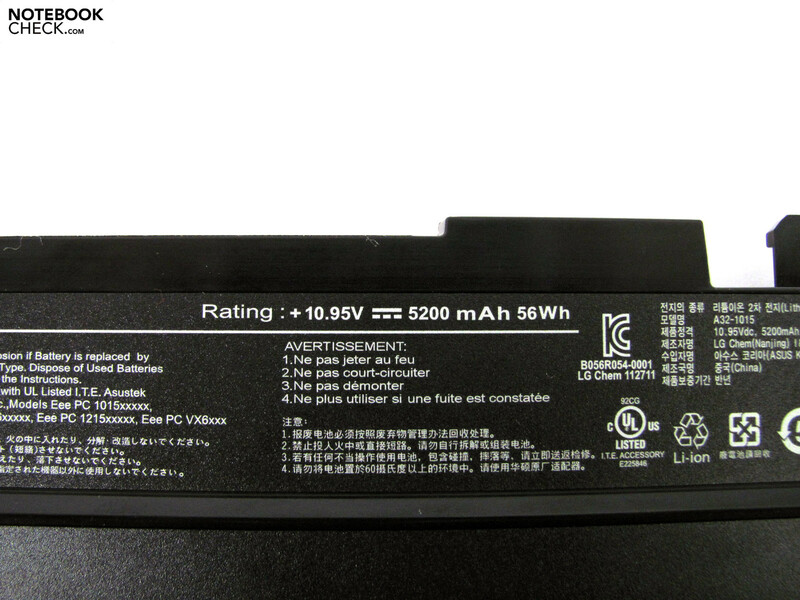 The internal power source in the Eee PC 1215N is a 6-cell battery with a capacity of 56 Wh. This has to serve a power consumption from 11.1 Watts up to 31.3 Watts, which are primarily supplied to the Atom D525 CPU and the Nvidia Ion 2 graphics chip. The difference we determined in the power consumption between the Intel GMA, and the Nvidia Ion 2, lies at about 8.4 Watts with a medium load. The battery life is nevertheless altogether acceptable, since the relatively large battery provides for running times of in excess of 5 hours. 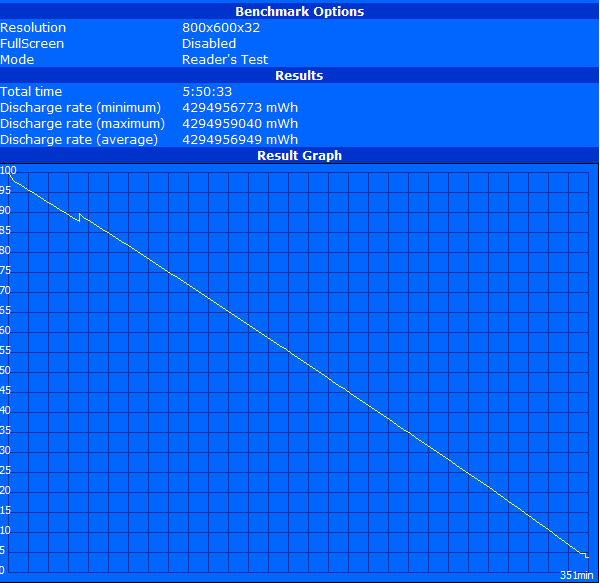 Using the Battery Eater Readers test (maximum possible run time, energy saving profile, minimal display brightness, and disabled additional power consuming components), the tested device reached a run time of 351 minutes with Intel GMA. 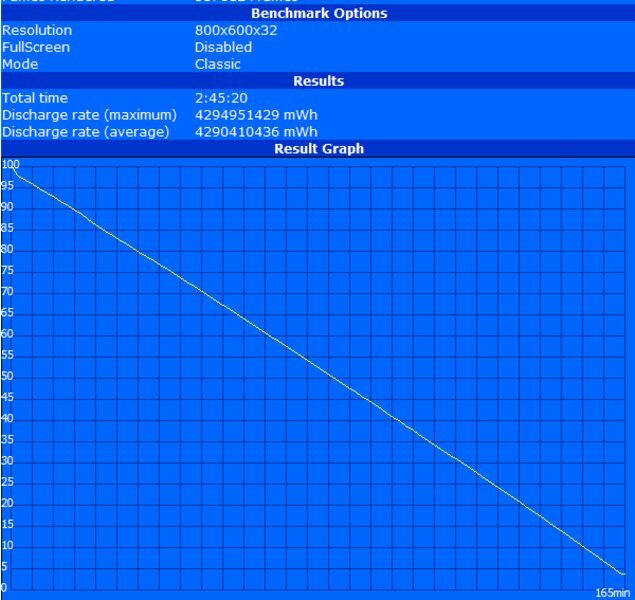 Using the Battery Eater Classic test, the full maximum power consumption of the components including Ion 2 comes to bear, and thus gives an indication of the expected minimal battery life (including all the power consuming components, and maximum display brightness). In this case it was nevertheless still possible to work without a power supply for 174 minutes. Furthermore if the Intel GMA 3150 is used, the run time is extended to 220 minutes under the same circumstances. The playback of video files was possible for a period of 241 minutes, and surfing with WiFi (both maximum brightness) was possible for 284 mintues. 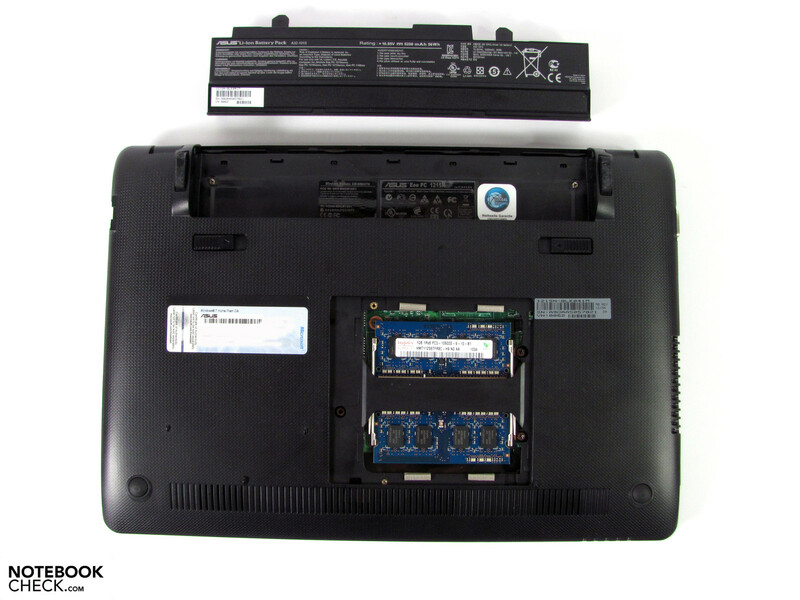 Asus has packed high performance components for Netbook standards into a solid case with the Eee PC 1215N, and provides good solutions in many areas. This includes the distribution of interfaces, the low emission characteristics, and within limits the mobility including the battery life. The performance is good for this category of Netbook, and master a large proportion of common home user tasks with ease. As far as games are concerned, the Eee PC is merely suitable for the entry level gamer playing less demanding titles. Unfortunately a low contrast and brightness display with a reflective surface was adopted, which severely limits the possible areas of use. The price also appears to be a little bit high in light of the fact that there are currently CULV notebooks available at a retail price of in the region of 500 Euros. 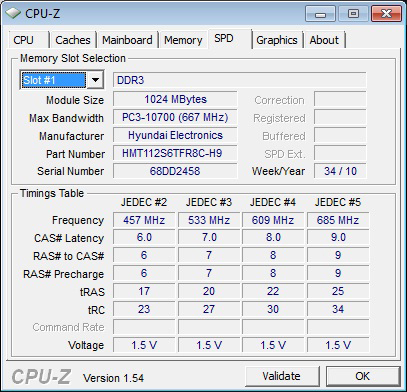 2x 2 GB DDR3 RAM modules are included. Other access is not available. 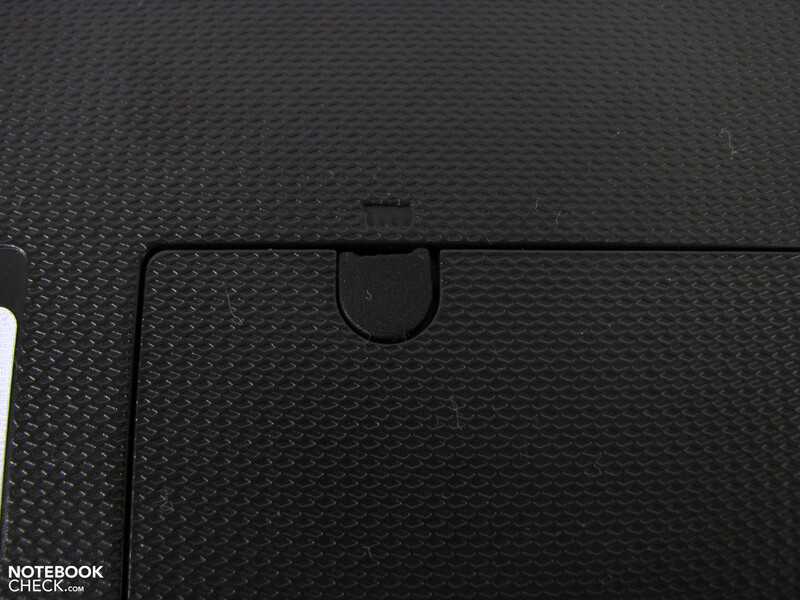 The RAM access is fixed with a screw under a rubber cover. The hinges hold the display without difficulties. 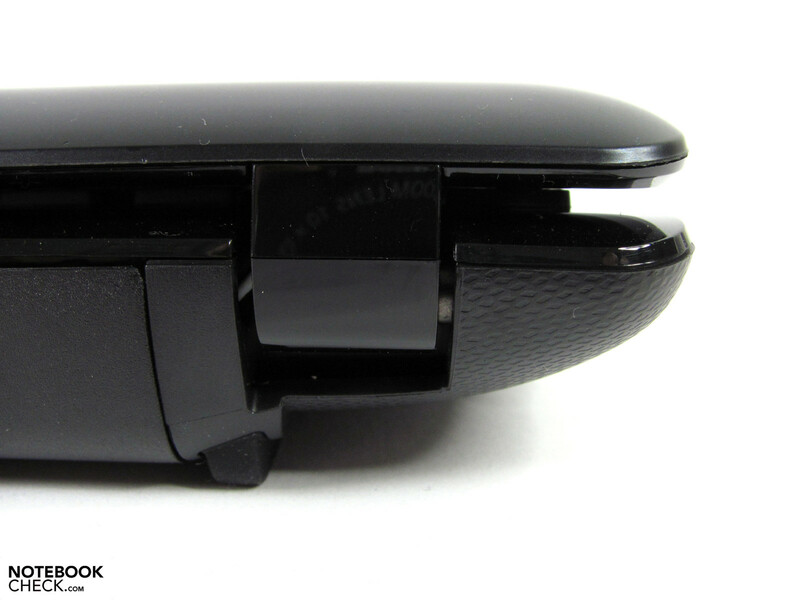 The battery is flush with the rear. Decent status LEDs on the front. The CardReader is positioned well for easy access. The VGA output offers a good picture with 1280x1024, as well as the HDMI thanks to digital connectivity. 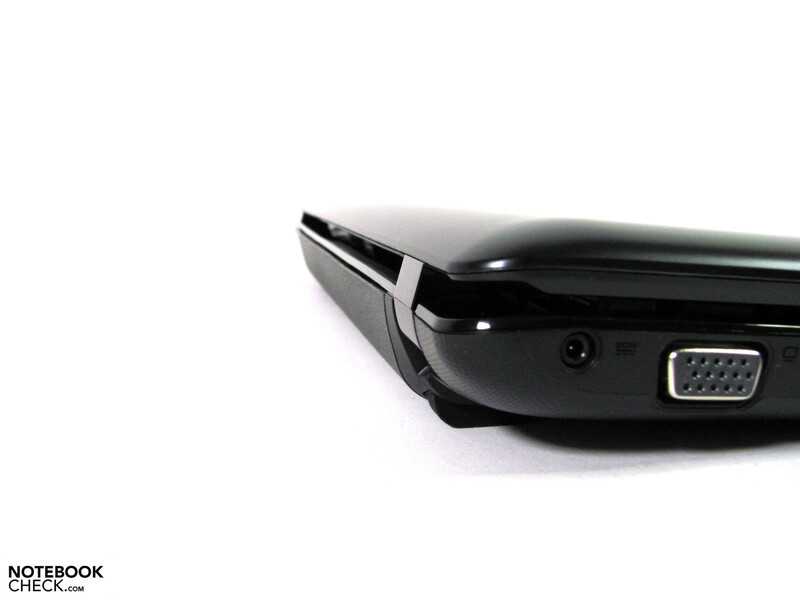 The webcam can be switched on and off with a sliding switch. On top of this the reflective surface requires consideration for the seating position. The display represents the current standard but has relatively little brightness. ...but is widened by the large battery. ...but in return a reflective display has been adopted. The battery offers 56 Wh of capacity. 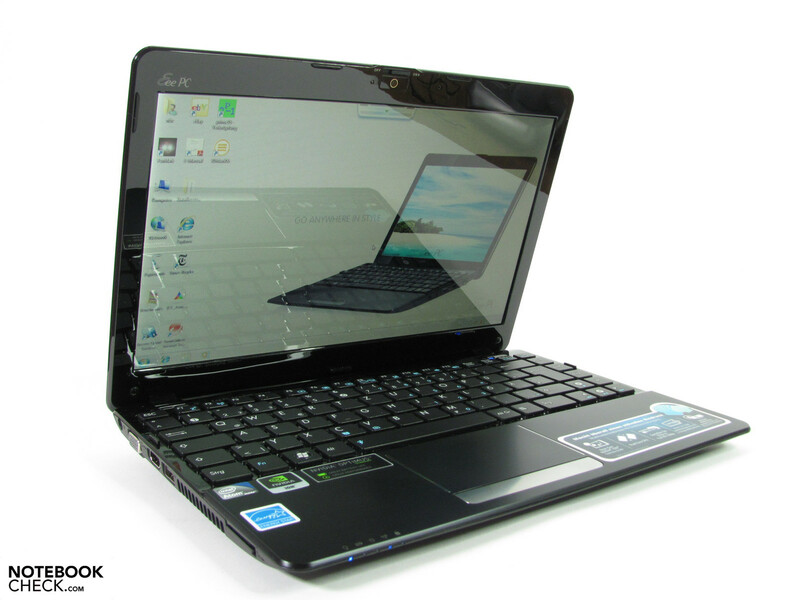 High performance Netbook combination with good features including CUDA support. A significantly better display. Particularly contrast, brightness, and the reflective surface are disappointing. The smooth performance with Optimus and the moderate power consumption despite of the Nettop CPU, especially under full load. Can be found in the CULV camp, and with more affordable AMD combinations that include HD4200 graphics.